My son got married recently. The wedding took place on Scotland Island which is a tiny island in a beautiful estuary called Pittwater just north of Sydney, Australia. As access to the island is only by ferry, the small wedding party met at Church Point (an hour’s drive north of Sydney) to make the ferry crossing together. After the crowds and traffic of the city, this area was wonderfully quiet and peaceful. With no restaurants, shops or public facilities, Scotland Island is not a tourist destination. It is an island of mainly bushland with holiday homes (many of which are also Airbnbs). 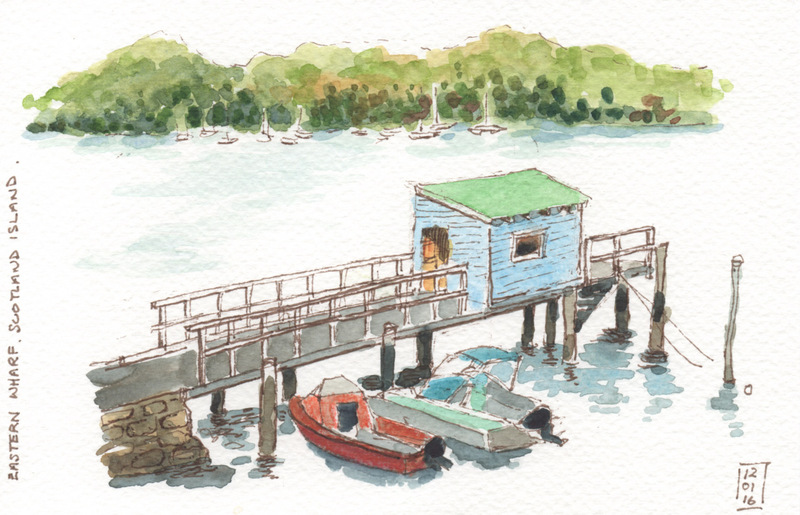 There are 4 ferry stops around the island and our destination was the second stop – Eastern Wharf. The 15 minute ride was almost too short. 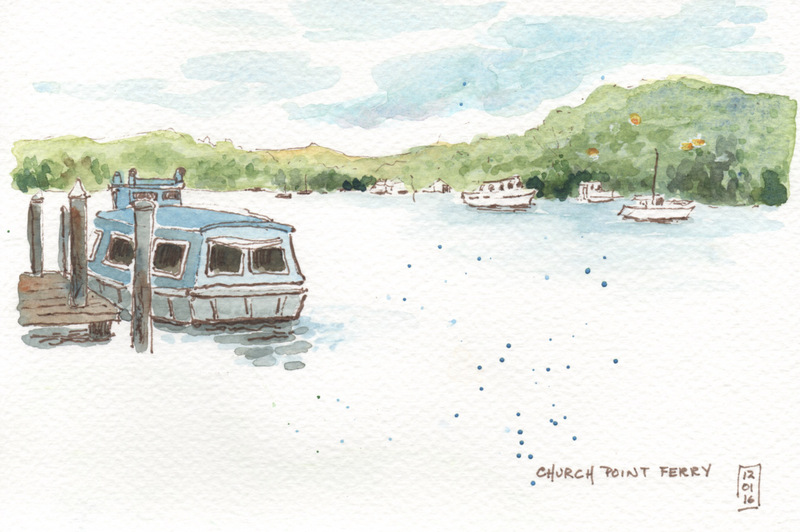 Here is a sketch done at Church Point ferry stop while waiting for our ferry to arrive. 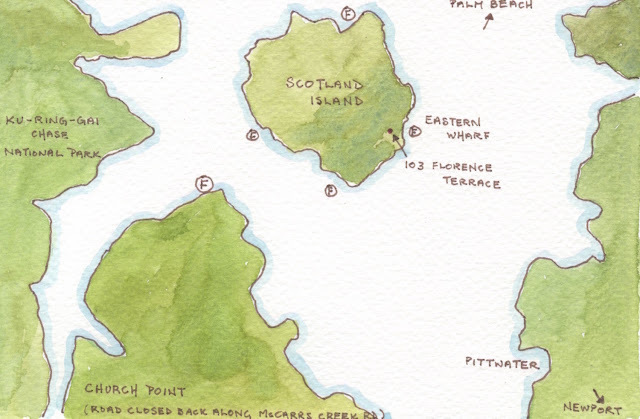 Only 1 kilometer in diameter, geologically Scotland Island was a hill in a valley. When sea levels rose after the last ice age, water flooded the valley forming Pittwater and creating an island. The families of the bride and groom had not met in person before this wedding and the group spent the long weekend sharing a house on the island. On the first morning we were awakened (too early) by a brilliant sunrise, shining water and the roar of speed boats leaving the many piers. Even the kookaburras laughed at our rude awakening. What a wonderful way to start the day! 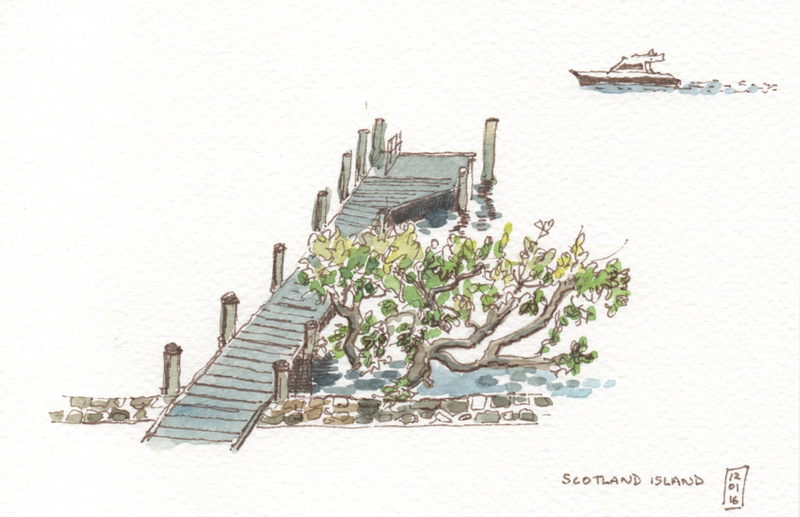 Here are a couple of sketches of the many piers around the house we stayed at. 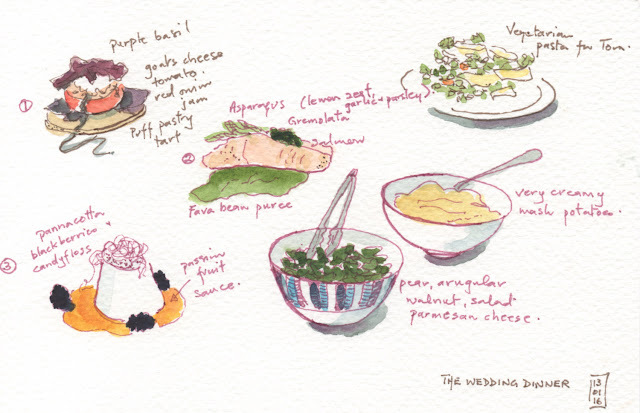 The chef hired to prepare the wedding dinner did not disappoint. He arrived with an assistant, all his ingredients and cooked the meal on site for 16 guests. 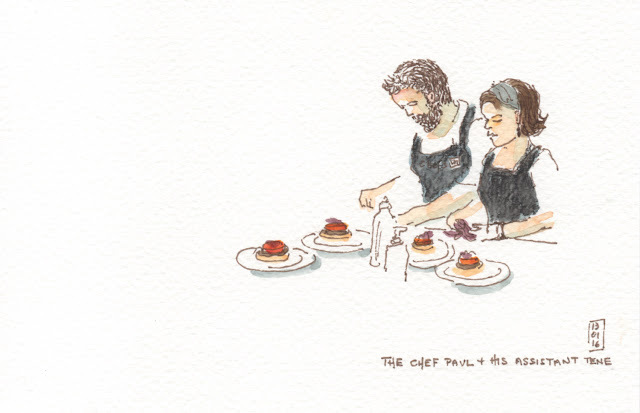 It must take a lot of confidence to produce a meal for so many in an unfamiliar kitchen. Here's what we had for dinner! I chose not to sketch during the wedding ceremony but here is a sketch of a quiet corner in the wonderful house we stayed at. The new extended family brought together people from Australia, New Zealand and Singapore. A beautiful wedding, stunning location, great house and a bonding of interesting people. It was such a happy and memorable few days! 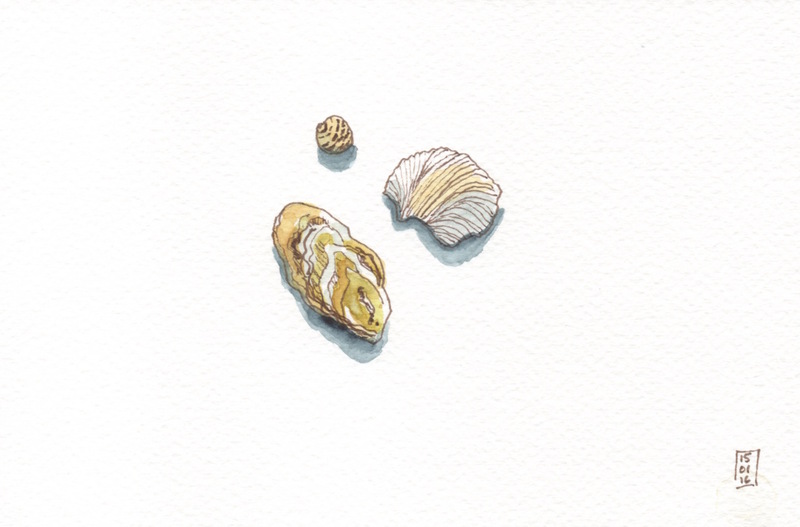 I usually sketch in a sketchbook but these weekend sketches were done on pre-cut similar sized pieces of watercolour paper. I’m pleased to say my gift to the bridal couple of 9 sketches went down well. 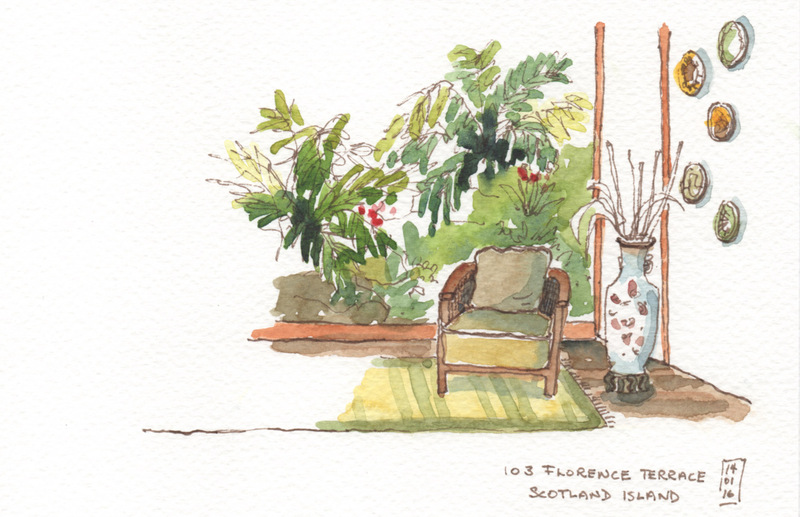 A short version of this post was accepted as a guest post on the main Urban Sketchers website. See here.